Thanks you, aragorn and swami both.. Thanks to my mom and dad for my upbringing. Above all, thanks to all the fans who have made this moment possible!!! Love you guys muah muah muah!! Last edited by kalidas; June 1st, 2014 at 01:21 PM. Chalo abhi roz apne tweets daalna idhar .. Thanks for explaining. Facebook also has embed feature there, however it's not working. Last edited by log1iszero; April 14th, 2017 at 10:39 PM. If the necessary code for FB is not added on echarcha, it wouldn't work here even if they have it. 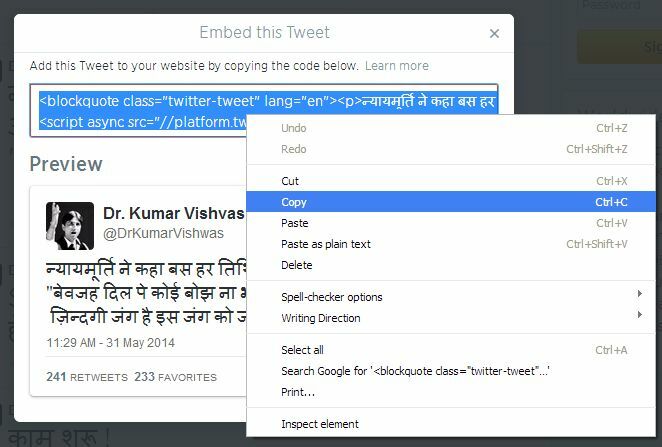 The required code to embed tweets is added on echarcha, that's why it works.